In November 2012, Global Research launched our Radio program: produced by Michael Welch in collaboration with CKUW 95.9 FM (University of Winnipeg, Manitoba). The Global Research News Hour also airs on university campus, college and community radio stations in Canada and the US. Scroll down for details. In the US, the GRNH airs out of Boston College, Mass. and Progressive Radio. prn.fm. The programme is also podcast at globalresearch.ca. 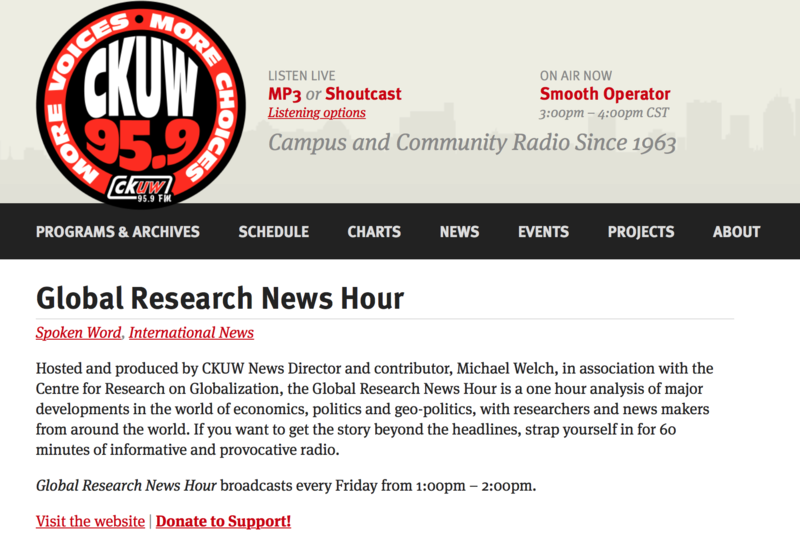 Produced by Michael Welch, the Global Research News Hour airs every Friday at 1pm CT on CKUW 95.9FM in Winnipeg.